Congratulations to the Design Team semi-finalists! Hello Spring!!! I'm so ready for the beautiful spring weather! Today I have a beautiful spring card to share with you that I created using the Cherry Blossom Retreat Collection. My sweet sister-in-law, Randi, commented on my card last week and she referred to it as a "secret garden". I loved that name so I've borrowed it for this card. Instructions: Card base size is 5 x 6”. Cut white cardstock to 10 x 6”, score and fold at 5” on the long side to create a 5 x 6” top fold card base. Cut two pieces of paper from the Cherry Blossom Retreat paper collection 4 7/8 x 5 7/8”. 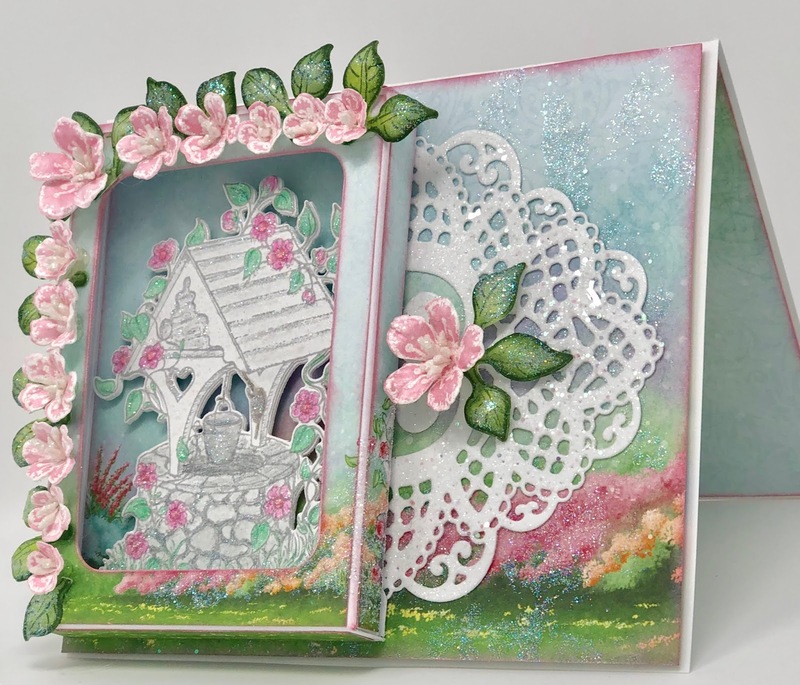 Ink the edges with Pearlescent Coral ink and adhere one to the card front and one to the inside. Cut paper from the collection 2x 4 3/8 x 3 1/8” - 2x 3/8 x 4 3/8” and 2x 3/8 x 3 1/8” to cover the 3 1/4 x 4 1/2” shadow box. Use the Cut Mat Create 1A die to cut the opening in the front. Ink all the edges with Pearlescent Coral ink and adhere to the shadow box using dries clear adhesive. Diecut the decorative die from the Daydreams Bridge set from white cardstock, sponge with dries clear adhesive and sprinkle with Rajni Chawla’s Crystal Clear glitter. 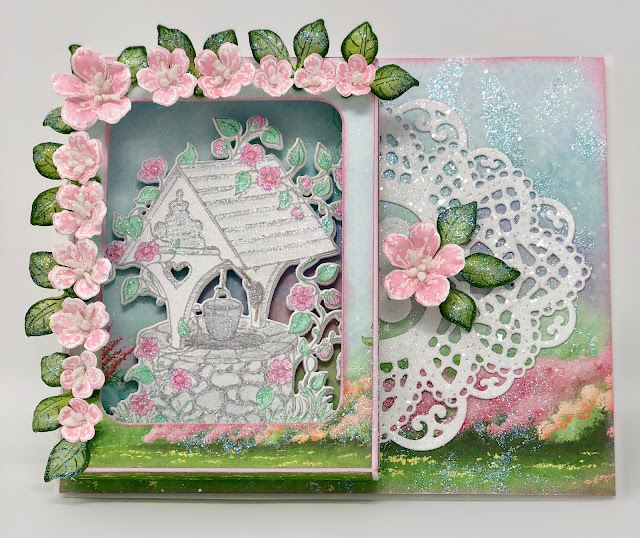 Stamp the Tweet Cherry Blossoms on Floral paper with VersaMark, sprinkle with WOW Sparkling Snow Embossing Glitter and heat set using the Heat it tool. Color with Pearlescent Coral ink, diecut using the coordinating die. Stamp the leaves on floral paper with Olive ink, color with leaf green and diecut with coordinating die. Place the flowers and leaves in the Cherry Blossom mold, spritz with water and run through the diecutting machine. Finish shaping with Deluxe Flower Shaping kit. Pierce the flower centers, add stamens and use hot glue underneath the petals to set. Sponge the leaves with dries clear adhesive and sprinkle with glitter. 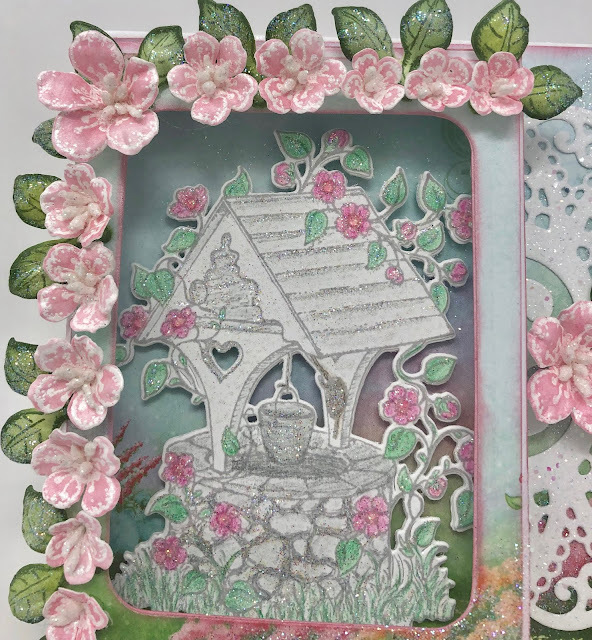 Stamp the wishing well on white cardstock using Archival Shadow Gray ink and color with Prismacolor Pencils and blend using Tombow Dual Marker Blender and odorless mineral spirits. Diecut using coordinating die. Diecut three more times from white cardstock and adhere the layers together to form a stronger diecut. Spritz with Sheer Shimmer Spritz – Sparkle. When dry, lightly dab with dries clear adhesive here and there and sprinkle with Transparent Ultra Fine crystal glitter. Adhere to the inside of the shadow box using dimensional dots. Adhere the leaves and the cherry blossoms to the front of the shadow box as shown. Adhere the decorative die to the back of the shadow box on the right side. Adhere the decorated shadow box to the left side. Add a cherry blossom and leaf cluster to the decorative die next to the shadow box. Using a sponge, dab dries clear adhesive randomly over the card and sprinkle with Transparent Ultra Fine crystal glitter. You can never have too much glitter!!! Please be sure to visit the Heartfelt Creations Blog to see all of the magnificent projects created by the fabulous design team. 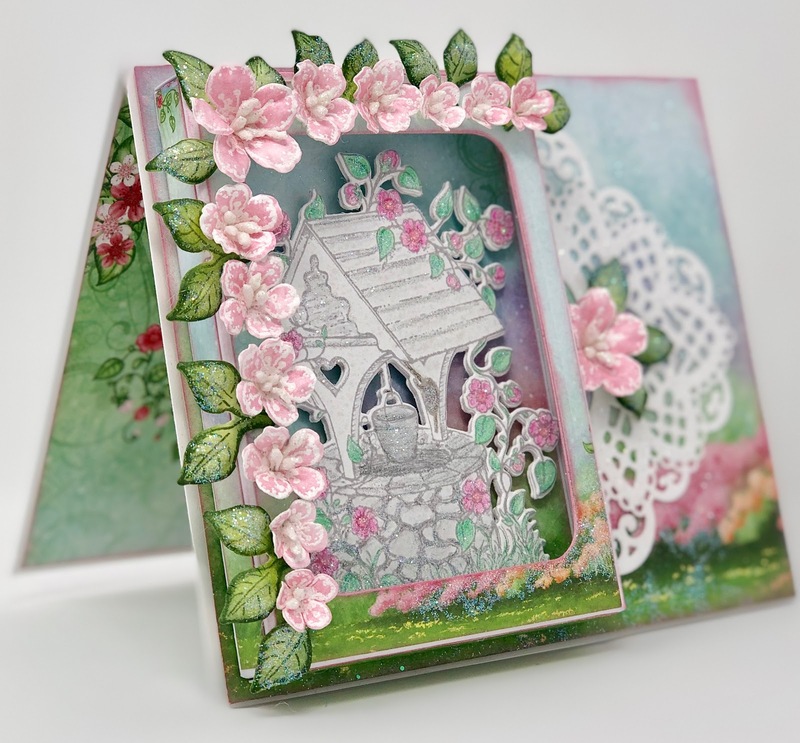 Beautiful card and love the colour of your flowers! Beautiful card Janet!! Love your secret garden! Thank you Robin...you're always so kind!